Join us for our 37th year of sharing dance. 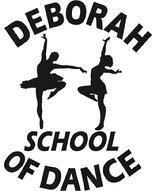 Deborah School of Dance is a family owned and operated dance school that has been in business for the last 36 years! We offer classes for ages 1 and up. Dance develops self confidence and coordination of the mind and body and should be a part of every child's education. Not only that, dancing is fun! Deborah School of Dance is fully insured and registered with the Better Business Bureau. Recital 2019 "Wonderful World of Dancing" is scheduled for May 31 and June 1 at VSU. Early Bird Ticket Sales, ONE DAY ONLY, Saturday, May 4, 2019, 11 AM - 2 PM. Recital Newsletters is now posted. Click here. You can now register and make payments online at our new Parent Portal. If you have any questions regarding what class you should register for please call or email us. If you don't want to register online, no worries, you can still register by visiting us. Note: If you have already registered in-person, when setting up your Parent Portal account please search for your name and your child's name.